When it comes to adopting a baby, prospective parents have a lot of logistical issues to work out to ensure a smooth transition. From following the strict guidelines and regulations to setting up the baby’s room, chances are that you’ll have your hands full before the big day! The adoption process is often summarized as a roller coaster of emotion, rife with anxiety-filled wait times and the moment of elation when you hold your new miracle for the first time. A is 4 Adoption is here to help every step of the way, providing expert guidance and financial support to ensure that the baby receives the very best attention during this stressful time. If you are looking for an adoption agency in California, you’ll be happy to know that our adoption center is here to offer better all-around services. We work hard to relieve the stress while cutting through the red tape as much as possible. In a lot of domestic adoption cases, the adoptive parents will be required to travel to their infant’s city and stay for a predetermined amount of time to make the transition. This trip is often a big contributor to the already elevated stress levels. Today, we’ll begin to look into a few travel times when it comes to the domestic infant adoption process. Following this tips may help you if you are about to travel to meet your new child. For those wanting to learn more, be sure to contact our helpful staff today! The best advice we can give to any family is to plan ahead. While the adoption process often consists of long waits and stressful decisions, some adoptive parents have been chosen and were required to mobilize on very short notice. Adopting a baby revolves around the due date, so be sure to plan ahead whenever possible. Proactively getting your checklist done in advance will allow for more leeway in case something doesn’t go perfectly to plan. Beyond this tip, though, you can do a lot more to be ready when the big day finally comes. Domestic infant adoption is often done at the hospital where the baby is born, requiring you as the adoptive parents to make certain logistical plans before traveling. In many cases, it is vital to bring gear for your new miracle, supplying him or her with all of the items required of any infant. Diapers, wipes, clothing, hats, and more can help to make this exciting transition a little smoother for everyone involved. Be mindful of how many items you bring, though! Some excited mothers have realized the error of their ways once all of the bags were packed, with the new baby’s stuff taking up more room than acceptable. Planning ahead should help you to determine how long you’ll be staying in a different location, supplying a proper count for how much baby gear should be brought along. As the parents, you will also need to bring your own bag for the hospital. This collection can include cosmetics, toiletries, travel essentials, and the equipment needed to properly document this eventful occasion. Cameras and other technology can be handy during this day, so be sure to pack properly to ensure a happy outcome for everyone. Staying in a different city may require a lot of logistical work to ensure that you are there on time and can make it home with your new child when everything’s said and done. Proactively calling ahead and searching for the best flights (when necessary) can help to alleviate your stress level in addition to your budget. Online flight booking allows customers to find the perfect option for every situation. A is 4 Adoption recommends flying with an airline that allows for flight changes in case a new development speeds up or delays your travel plans. Also be sure to reserve your transportation and lodging for this trip. Oftentimes, travel sites will offer big discounts when you combine flights with car rentals and hotels. If you have any questions, your adoption agency or center should be able to offer helpful advice! Travelling for any normal occasion can be a stressful experience, but when it comes to adopting a baby, the logistical challenges can prove to be very draining. 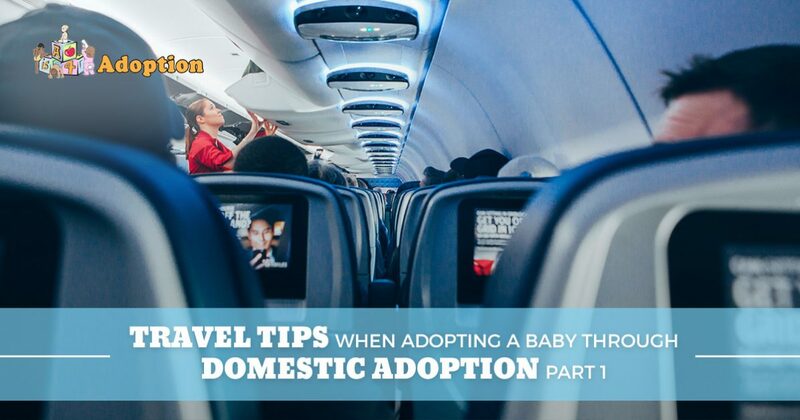 Next time, we’ll continue on this topic by discussing a few more tips that may help you in your adoption travels. A is 4 Adoption is here as your alternative to any adoption agency in California, offering comprehensive support and customized solutions to find the best outcome for the adoptive family, biological parents, and child. Contact us today to see how we can improve your adoption process!